Implementing PrinterLogic’s Pull Printing solution has many benefits, including lowering costs, increasing security and reducing waste. It also adds convenience for end users who simply walk up to a printer, authenticate using their badge or enter their credentials on the printer’s LCD. They then are able to select which jobs to release from their queue. But what happens if your printer does not have a control panel? Does it mean you need to spend a lot of money and upgrade your entire printer fleet? PrinterLogic has an option that could be the correct choice for you. It is Simple Badge Release, the ability to release print jobs to any network printer with a simple swipe of a badge. In Devils Lake, North Dakota, they have a problem. The lake waters have no way to flow to a natural river causing flooding in the local towns each time the lake water levels rise. Instead of taking on the cost of moving homes, families and towns, the city decided to build a dike to control the flood waters. Every couple of years, they must build the dike higher and higher to combat the flooding issues causing additional expense to the government. However, it’s considerably cheaper to build up the sides of the dike instead of relocating all the residents of the small towns surrounding the lake. At PrinterLogic we understand that you have legacy devices that do not support our embedded control panel applications to release print jobs in a user’s pull printing queue. As much as we would all prefer new large Multi Function Devices (MFD) with low operating costs, sometimes we are like Devils Lake and have to make decisions based on many factors that don’t allow for replacing your entire printer fleet. There can be high up front costs to purchase and integrate new large MFDs into your environment. You have already spent the money on your current devices, and you might feel you have not utilized these devices to the end of their useful life. You shouldn’t have to update your fleet based on limited support from your print management software. For this purpose PrinterLogic has introduced Simple Badge Release functionality. We support Pull Printing from any network printer without having to replace your entire fleet. This could be legacy printers or single function devices that do not have a control panel to use for releasing print jobs. 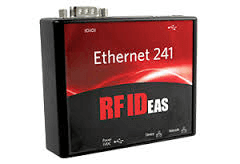 Simply use a network card reader such as the RF IDeas Ethernet 241 and associate the device to a printer from within the administrative Printer Installer admin console. Plug the card reader into the network and it will be ready for use. With Simple Badge Release your users will have the ability to release their jobs at any network printer. They simply walk up to a printer, swipe their badge or key fob at the network enabled card reader, and their jobs are released and printed at the associated printer. You will have the option to configure whether it is the user’s last job in the queue, or their entire queue that gets released when they swipe their badge. It makes it a very simple process for IT and your end users. PrinterLogic has fantastic support for Pull Printing with devices with an embedded control panel and a badge reader. While we realize this will be the preference when possible, there are times when you can’t use a supported device. With Simple Badge Release there is a simple way to provide the security and convenience of Pull Printing and Secure Printing at any network printer.